The Sri Ganesha Temple Cultural Committee organizes cultural programs consistent with the Temple mission, and to foster increased understanding and appreciation of the Indian cultural arts in Nashville. Patronage for the cultural arts has been an ancient tradition associated with Hindu temples and we are proud to maintain that cherished ideal. We organize 7-8 programs during the year – generally a good blend of Hindustani/Carnatic classical music, devotional and classical dance programs. 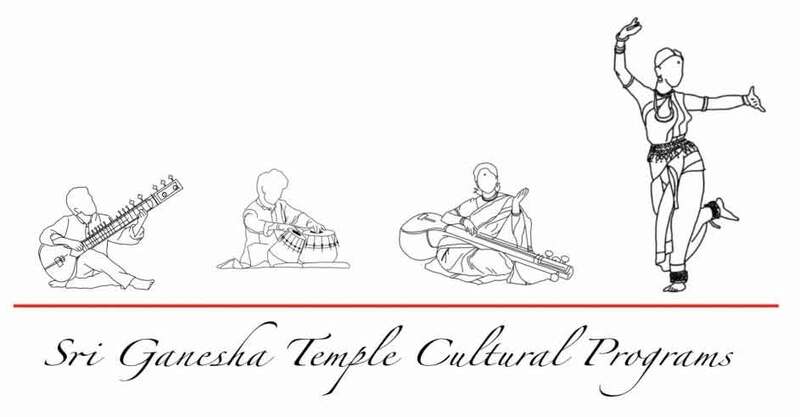 We have created a strong social media presence on Facebook to promote and publicize Temple cultural events. In 2015, we established the Annual Cultural Patron Program to provide a sustainable way to fund programs. Community members who value Indian cultural arts choose to donate towards this noble cause, and also get admission to all the programs. We have averaged around 30 generous patrons who have donated a total of about $10,000. Please help us meet our goal to increase our support to 50 patrons & $18,000 annually. Please donate at levels of $150 (Single), $200 (Couple), $250/$500 (Family). If you can help us to host artistes or volunteer in other ways, please contact a committee member.